A Might Chilly -- And Darned Cold Too! No one displayed the temperature quite as graphically as did Seth Hunter. 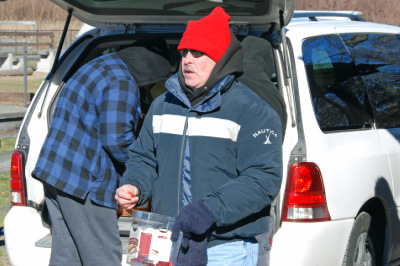 Beneath several layers, Greg Lucidi seemed at home in the chill. 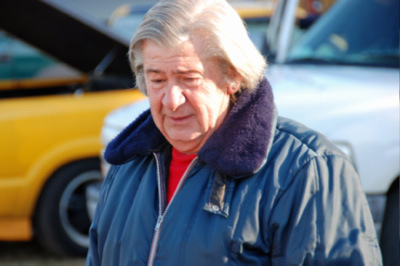 Warm in his bomber jacket, Sal Lucania appeared impervious to the cold. 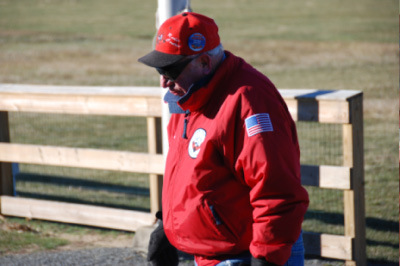 Paul Abati put the importance of club colors above staying warm. But no one appeared to defy the cold with quite the same attitude as Stan Karczewski. 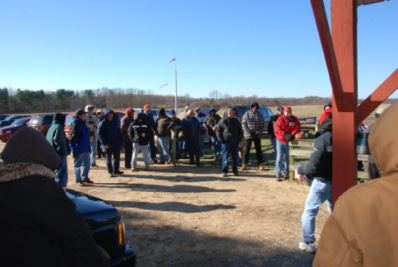 Members huddling around a car heater was a common sight. Alright, enough! ... Augie? ... Jans? 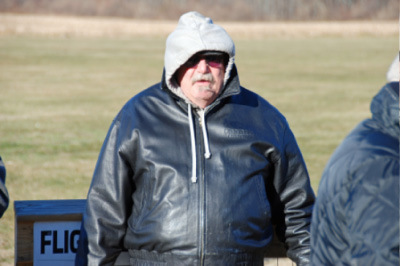 Several members managed to ignore the chill and fly; Jim Van Buren was among the first. Keith Zimmerly opted for something simpler than his usual fare. Alex Nyere and Rich Lee demonstrated speed flying, achieving six flights on a single battery. Jans Brower and his oldtimer are reliable flyers at these events. 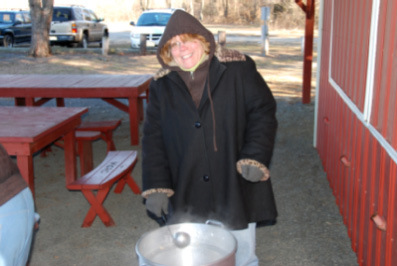 Meanwhile, back at the kitchen, Patty Sagot served cups of hot minestrone soup. 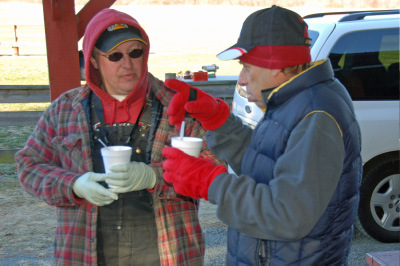 Chef Dave Sagot (right) explains his special spicy soup recipe. 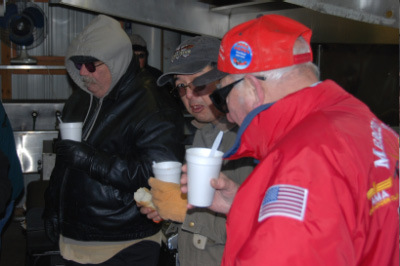 Intrepid (and not so intrepid) flyers huddled together sharing hot soup in the kitchen. But it wasn't just the soup and flying that drew the crowd. 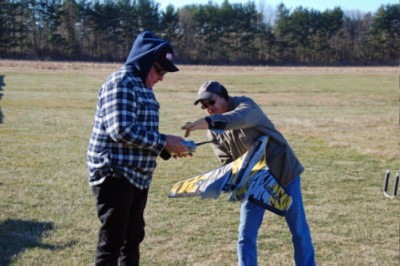 Vigilant attention, a skill honed on the flight line, is also handy for winning a ham. Brian Bunda took charge of the tickets this year. 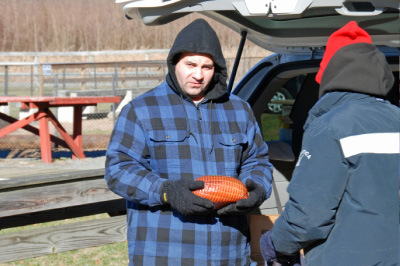 Pat Monacelli (and Drew Watros, hidden in the van) helped hand out the hams. 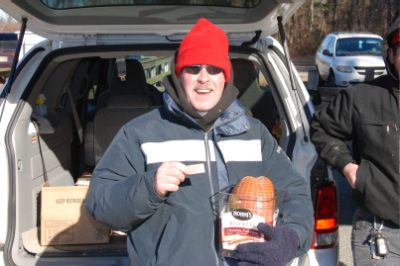 A master at timing, Allan Schear arrived at 11:45 and won the first ham at 11:52. Satisfaction flashed across Brian's face as he realized he had called his own number for the last ham. 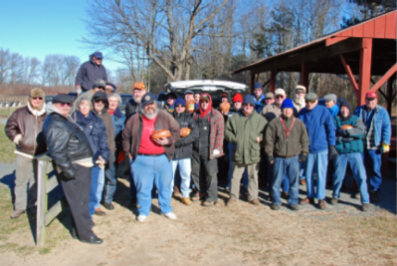 A parting shot of the 2009 MCRCS Ham Fly participants. Over the past few years we've come to expect that the weather will be great for our Turkey Fly and miserable for our Ham Fly. 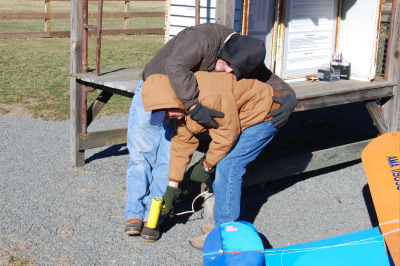 This year we got something of a surprise: As the Ham Fly opened Thursday morning, January 1, 2009, the ground was dry, the sky was blue, and the sun was bright. 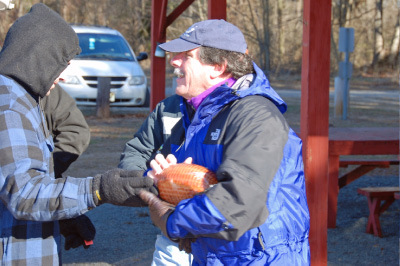 In fact, the weather was almost identical to the terrific weather we'd had for the Turkey Fly. Except it was 40° colder. The predicted temperature was 22° with a wind chill of 9°. However, local car thermometers suggested the actual temperature was more like 17°, which would have resulted in a wind chill of about 4°. Not to dwell on the temperature, just note that it was COLD. The temperature and wind chill affected some more than others. In general, the electric flyers were able to get their flights in quickly, without the additional insult of cold glow fuel on their fingers. 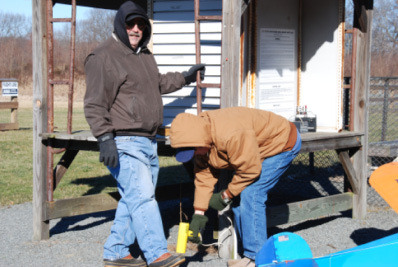 Probably none demonstrated better adaptation than Alex Nyere and Rich Lee, who in a well choreographed display of launch-land-launch-land managed to both get their three flights in before the first battery got cold. Fueled flyers showed remarkable success and perseverance, however, demonstrating how with a powerful starter a well-tuned engine, the winter is no deterent. Flying was maybe a bit less daring than in warmer weather, though, as no one wanted to spend time sorting servos from balsa at a crash site. Perhaps as a result, all models that flew went home relatively intact. 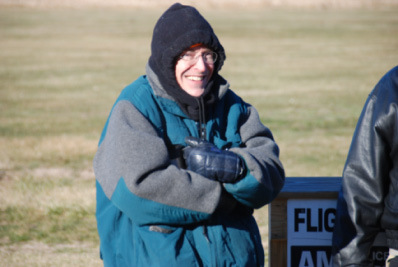 Staying warm between flights proved a good alternative to hypothermia. Members approached this in several ways. Some clustered together in cars, absorbing all the BTUs available from their car heaters. Others huddled in the kitchen, nursing a cup or two of Dave and Patty Sagot's hot and spicy minestrone soup. 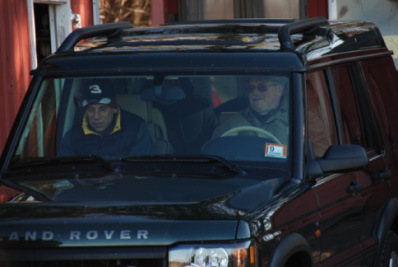 But judging from the pictures, no one experienced more pleasure from getting warm than did Augie Lucidi at the exhaust of Jans Brower's heat gun. And then there was Stan Karczewski; not even a near-zero wind chill was sufficient to get Stan into long pants. Brian Bunda, with the help of Pat Monacelli and Drew Watros, took care of the record keeping for the event. Brian handed out the tickets, one for showing up and one for each of up to three flights. Winners were determined by lottery. This was Allan Schear's first Ham Fly, but it provided him with an opportunity to demonstrate a sense of timing possibly developed by years in the news business. He had been at the field probably less than ten minutes when he secured the first ham with his winning ticket. The drawing proceeded with reasonable haste, the temperature remaining near its morning low. 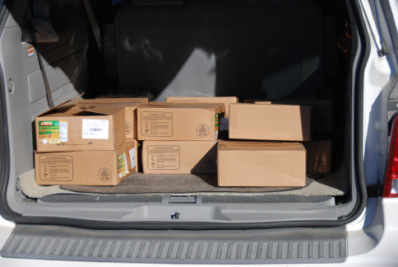 As Brian presided over the distribution of over 30 hams, he had to wonder when his turn would come. The answer came on the last ticket: Brian Bunda was this year's winner of the last ham. It's possible that flying went on well into the afternoon and that members huddled around the soup kettle frittering away the hours. However, the webmaster didn't wait around to see. 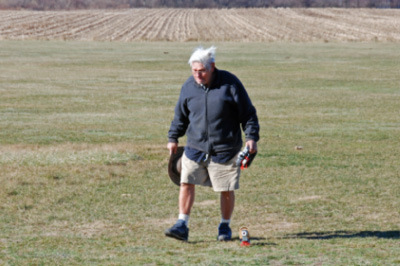 Rather, following the award of the last ham, he led what appeared to be a tight string of vehicles leaving the field for a presumably warmer environment. 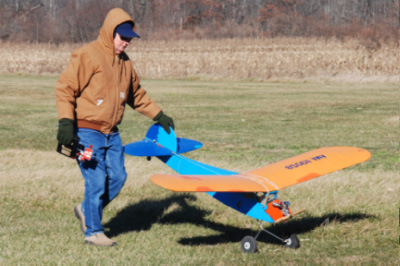 It was a great day for flying and camraderie, but it seemed prudent to save some fun for the rest of the year.